Former Guantanamo detainee Omar Khadr will remain incarcerated at Millhaven Institution’s maximum security facility with little chance of rehabilitation or parole for at least two years. Although Khadr would be eligible for day parole in March, it is extremely rare for anyone with this designation to be approved. His status will be reviewed in December 2014. University of Toronto criminologist Anthony Doob said he was dismayed that Corrections Canada chose to apply the standardized “Custody Rating Scale” for Khadr, which automatically designates him maximum security, despite the unique aspects of his case and reports of his good behaviour during his 10-year incarceration at Guantanamo. “They should be looking at his past, the circumstances of his offence, how old he was,” Doob said. “It’s perpetuating this view that he’s the same as the guy who is a terrorist or member of organized crime who killed somebody on the streets of Toronto yesterday. “The thing about approaching this the way they did ensures the outcome. I’ve never met Omar Khadr, I know nothing about him and I can go to the web and see that he’s going to be classified as maximum security. Khadr has been held at the Millhaven facility’s hospital for assessment since being transferred to Canada from Guantanamo on Sept. 29. The 26-year-old is now expected to be moved to a range in the general population with other maximum security inmates. The Khadr saga stretches back to July 2002, when at the age of 15, he was shot and captured following a battle in Afghanistan. In October 2010, he pleaded guilty to five Guantanamo offences including “murder in violation of the laws of war” for the death of U.S. Delta Force soldier Christopher Speer who was fatally wounded in the battle. His plea deal gave him an eight-year sentence and chance to return to Canada. Child and civil rights advocates, including Liberal Senator and retired Lt. Gen. Romeo Dallaire, have pushed to have him recognized and treated as a child soldier, and the UN condemned both the U.S. and Canada for the prosecution of a juvenile for war crimes. Khadr’s lawyer, John Norris, said he was disappointed the designation will limit Corrections Canada’s ability to provide rehabilitation options, aside from Khadr continuing his education and religious counselling from a prison-approved imam. “Their hands really are tied by the fact that he’s stuck in max, because they can’t help him get ready to return to the community,” Norris said, adding that he is “weighing the options” in terms of any legal challenges. Véronique Rioux, a spokeswoman for Corrections Canada said she was unable to comment on individual cases, citing privacy concerns. It is believed Khadr will receive similar rights as other inmates, including the ability to see visitors. Norris said Khadr has already met with his mother Maha Elsamnah and Arlette Zinck, an English professor from King’s University College in Edmonton, who began providing him lesson plans and visiting him while he was incarcerated in Guantanamo. Any rating over 134 is considered maximum security. “During the intake assessment interview Khadr emphasized that his current sentiments/beliefs reflect pro-social changes in attitudes promoting peaceful resolution to conflicts,” the report states. But the report also notes that given Khadr’s limited access to other inmates since his arrival, it is difficult to assess how he will interact with other prisoners. 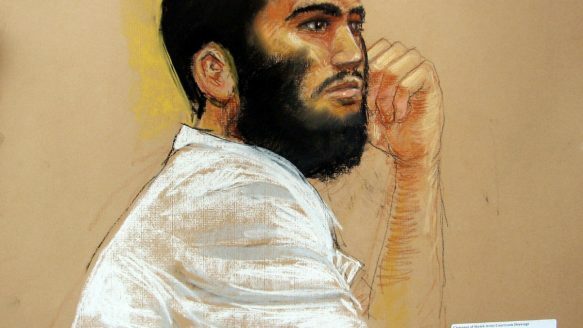 Concerns about Khadr’s connections to Al Qaeda as a teenager and during his incarceration at Guantanamo are noted in the report, which recommends monitoring his association with other offenders, “particularly those who look up to him.” A security officer noted a Millhaven inmate convicted of terrorism communicating with Khadr through his cell on Oct. 1, 2012, the report states, without giving any further details. There is no mention of the reports by psychiatrists Michael Welner or Alan Hopewell, which Public Safety Minister Vic Toews personally requested from U.S. defence secretary Leon Panetta, delaying Khadr’s expected transfer to Canada and infuriating Obama administration officials eager to transfer the Toronto-born detainee. Welner told a Guantanamo courtroom during Khadr’s sentencing hearing that he was “highly dangerous” and considered a “rock star” at Gitmo.